Amazing answers to over 200 questions about our planet. Explore the science behind more than 200 questions about our planet. DK's exciting new Earth encyclopedia answers children's biggest, and weirdest, geography questions, covering volcanoes, earthquakes, oceans, and more! Did you know that the Earth's biggest waterfall is underwater, or that mountains grow? This children's book, ideal for ages 6-8, will help inquisitive minds find out the answers to all the questions they may have, and some they hadn't thought of yet! Can you freeze in a desert? Can humans make it rain? Is there life on moss? Covering amazing landforms, deep-sea wonders, and awesome weather, Do You Know About Earth? 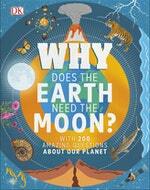 helps children get to grips with the massive topic that is our planet. Important issues such as global warming and plastics in the ocean are introduced alongside key geography topics so that children can learn all about how nature works, and discover what we can do to keep the Earth healthy. Get your children learning with this amazing Earth book, which is packed with fantastic facts for curious minds. Love Why Does the Earth Need the Moon?? Subscribe to Read More to find out about similar books.